Winners in the new German Stevie® Awards, a business awards program created to recognize achievement in the workplace throughout Germany, were announced today. 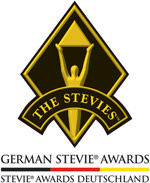 The complete list of Gold, Silver and Bronze Stevie Award winners is available at www.StevieAwards.com/Deutschland. The Stevie Awards are widely considered to be the world's premier business awards, conferring recognition for achievement in the workplace over the past 13 years in programs such as The International Business Awards and the Stevie Awards for Women in Business. The new German Stevie Awards are only the second national Stevie Awards program, after the 13-year-old American Business Awards. Stevie winners will be celebrated and presented their awards at a gala banquet at the Ritz-Carlton Hotel in Berlin on Friday, 27 March. Tickets for the event are now on sale. Gold, Silver and Bronze Stevie Award winners were selected by more than 50 executives who participated in judging the week of 16 February. A second round of judging will determine a very few Grand Stevie winners from among all winners. The Grand Stevie winners will be announced at the 27 May banquet in Berlin. For more information about the German Stevie Awards, visit www.StevieAwards.com/Deutschland.